Emacs has support for multiple version control systems and as such, for many version control operations. But there are operations I prefer to execute from the shell and one of those operations is branch merging. To be honest, I do not know whether that can be done from Emacs and for Subversion, which is still the main version control system at my workplace. 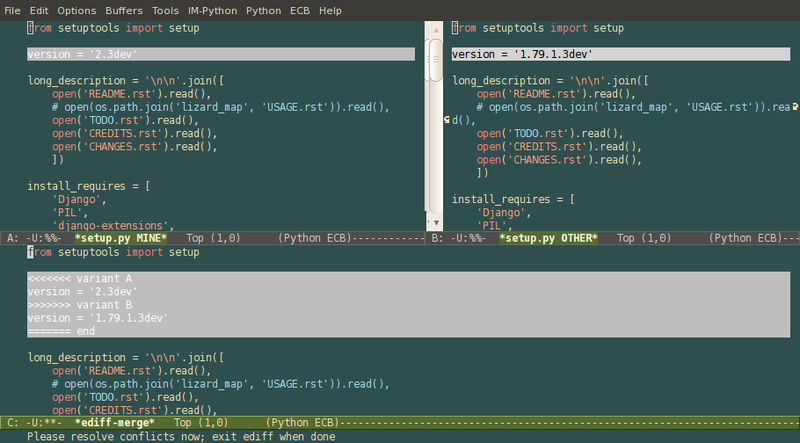 However, Emacs can support you when you have to resolve merge conflicts, thanks to the Smerge minor mode and Ediff. In this blog post I explain how that works. Before I do so, I start with some background information about Subversion merge conflicts. This command tries to automatically merge the changes from changeset revision "initial" up to and including those from changeset "final" of the repository at <source URL> to the code at the specified <working directory>. The merge-left file contains the first revision that has to be merged from the source URL and the merge-right file contains the last revision. The working file contains the current version of the file to which the changes in the source URL have to be applied. Let us resolve the issue in the setup.py, When I open setup.py, Emacs automatically opens it in Smerge mode. This mode highlights conflicts, allows me to jump to the next (or previous) conflict etc. For me, Smerge is not the ideal tool for conflict resolution. It provides me with a single pane view of the conflicts where I prefer a two-pane view such as the one Ediff provides. Furthermore, I cannot seem to memorize its key-bindings, which always make me grab the mouse. The top-left pane contains the setup.py in my working directory as it was before the merge, the top-right pane contains the final revision of setup.py at the source URL and the bottom pane contains the merged version. The really nice thing is that as soon as I end the Ediff session, Emacs goes back to the conflicted file with all the changes done in the Ediff session applied. So if you have resolved all conflicts, the file is not in Smerge mode anymore. The only thing left to do is to save the file. After that, the state of the file as displayed in the vc-dir buffer changes from conflicted to edited.